And finally . . . farewell roadworks! It’s been a week of new beginnings and saying goodbyes. For many Peterborough residents I’m sure the main thing you’ll be happy to say goodbye to are the roadworks on Bourges Boulevard! Officially they end tomorrow (Friday 24 July) although the cones went earlier this week. Over the last few days we have been testing the traffic lights to make sure we have the best possible traffic flow through the new section of road. These improvements were needed but I understand they do cause disruption and frustration – however we do it because we believe the changes will benefit the city and those that live and visit here. Improving the boulevard was in part about making it more pedestrian and cyclist friendly but it also helps to unlock the growth potential of our city. The new crossings join-up the station side of the boulevard with the city centre, helping to bring forward the recently announced plans for North Westgate and Queensgate. This is the completion of another major project for the city and I would like to thank my officers, our colleagues from Eurovia and of course the public for their patience. I’ve also had a note of thanks from a local charity that were given much of the old paving and street furniture, and will now be using some of it to help create a new attraction elsewhere in Peterborough. The Peterborough Investment Partnership (a joint venture between the council and the Lucent Strategic Land Fund) has announced this week that it plans to submit an outline planning application for the Fletton Quays site in a couple of months. 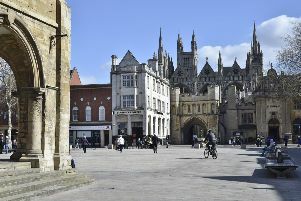 The PIP aims to bring new investment into Peterborough and kick-start development on several key city centre sites. Ultimately the partnership will help to support the growth of Peterborough by bringing new jobs, retail, housing and leisure facilities to the city. A new beginning for an exciting project to regenerate an area, close to the river, that should be buzzing with activity and we hope that this announcement will be the start of turning that vision into a reality. The job of the partnership is to obtain planning permission on Fletton Quays, and other future sites, and then for it to be sold to a developer to build it out. A sad note this week is that we said goodbye to Councillor Sheila Scott as she stepped down as cabinet member for children’s services. Sheila intends to leave politics at the next election to spend time with her growing family, and wants to use her final few months as councillor helping her ward constituents. I would like to thank Sheila for her years of devoted service in a very challenging area and I am confident I have picked a very capable new cabinet member, Councillor Andy Coles, to continue to drive improvements and ensure that we protecting and supporting the most vulnerable children in our city. Finally I would like to thank the PCSOs and police officers enforcing the cycling ban over the weekend on Bridge Street. Most of those that were breaking the law got off and walked but a few fines were handed out as well. As mentioned in a previous column we are working with our police colleagues towards further action on this issue that I know infuriates so many of you.